He is the same pattern as Ace the Tiny Squirrel with the addition of 3 small parts. With black yarn, follow the squirrel pattern found here, but do not brush out tail until you have made the white patch for the tail which is found below. 2) starting in the 2nd ch from the hook, sl st each ch. Lightly brush if desired before sewing to the head. Note: You can also just ch14 and not sl st the chains, it's up to you. The tail needs a white patch that you will sew onto the tail then brush the piece out as you did for the squirrel. f/o leaving a long tail for sewing. Sew patch to tail, make sure to sew all around the entire edge so that the patch does not lift up when you brush it. There is a whole gang of these tiny amigurumi patterns available. They all have written patterns plus a full video tutorial if you need it. There's a Lil' Tree pattern here. 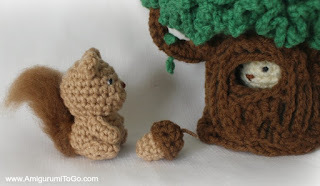 The tree holds 4 of these little amigurumis. and an owl for the tree here. I hope you enjoyed the patterns. Post pictures on my facebook page Amigurumi Freely. Or post them on instagram with the hashtag Sharon_Ojala. 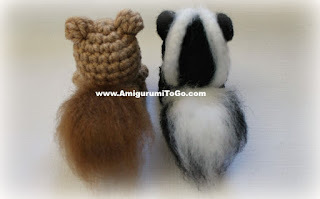 I have not seen a crocheted skunk before. He is adorable. Thank you, they are all soooo cute!! I make all of your patterns, love them all!! I love this little amigurimi. Cant wait to start this cute skunk. Can you make a brief tutorial on how you did the stripes on the skunks head? Im a little confused by this part. I would really appreciate it.